Late in 2010, a mural of a red wagon appeared on the side of the building. 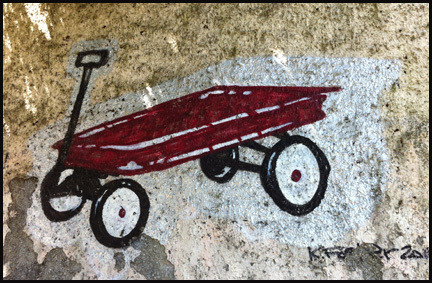 As I traveled to work each weekday morning, I saw that painting and that’s how I came to discover The Red Wagon. The café was apart of wave of retro diners that serve comfort food with a twist of some sort (inclusion of organic or gourmet ingredients, more refined cooking techniques etc). My initial reaction to my first meal there was the food was good but they offered smaller portions than a traditional roadside diner would but it served a purpose as breakfast places in the area were sorely lacking. I returned with friends for weekend brunches and weekday dinners, trying more items off the menu. Every so often, remnants of the space’s former tenant, a westernized Chinese diner, would appear in the form of pink floral rimmed serving plates. I guess the owners decided to re-use what they could. This was obviously before Guy Fieri visited the place in the summer of 2012. The Diners, Drive-ins and Dives (DDD)effect is astonishing. Today, as I commute to work in the morning, the same red wagon greets me along with a crowd of people standing in line to get into the diner. Pre-DDD line-ups only happened on the weekend but now even weekdays are problematic. The show featured two items: the Crisp Pork Belly and the Pulled Pork Pancakes. Since the episode of DDD featuring the Red Wagon aired, I haven’t had the opportunity to eat there because when you’re hungry you want food fast and line-ups won’t do. As a result, my friends and I often dart across the street for our weekend brunches. I’ve had both the pulled pork pancakes and crisp pork belly in past, but I was curious to see if the new found fame had changed either dishes. 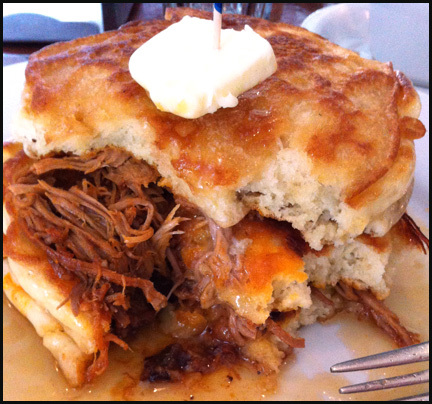 By passing the line by being a single and agreeing to sit at the counter, I eagerly awaited my pulled pork pancakes. The stack seems small and underwhelming but it is very filling. The pancakes are fluffy and rich with the taste of buttermilk. I really like the pancakes at the Red Wagon. The pull pork is tender and tangy. The special Jack Daniel syrup is complex. I tasted Maple syrup, followed by ripe banana and lastly a Jack Daniel kick at the end. My friends think I’m crazy in regards to the banana flavour, but everybody’s sense of taste is a unique combination of genetics and food experiences, so there! I like all 3 three components of the dish but not together. As a trio, it’s too much of a good thing. The dish is too heavy for my liking. 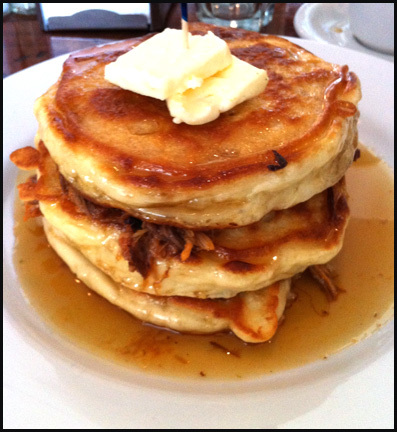 I would prefer the pancakes and syrup together and the pull pork to be the star in its own item, like a sandwich. On a second post-DDD visit, my friend and I managed to snag a table without a wait. Fortune was favouring us, so we both bought lotto tickets after our meal (I actually won $5). I ordered the Crisp Pork Belly platter. 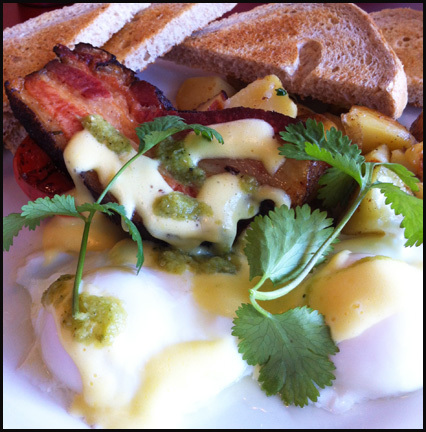 The dish comes with two eggs, griddled tomatoes, potato hash, toast, hollandaise sauce, salsa verde and of course the crisp pork belly. My eggs were poached perfectly. I wish the potatoes in the hash was browned a bit more but besides that nothing was a miss with the components of my meal. 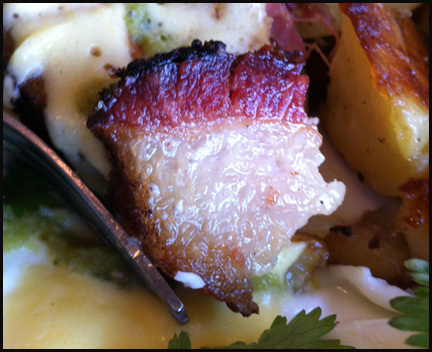 I like how the salsa verde added a tartness to help balance out the rich hollandaise sauce and pork belly. As for the crisp pork belly, it was delicious. It was well seasoned and it actually reminds me a little bit of the seasoning used for Chinese Roast Pork. I could definitely taste the all spice they use. The pork belly just melts in your mouth. Amazingly, it isn’t as greasy or heavy as one would think consider you are eating chunks of fat. Comparing my 2 post-DDD visits with my pre-DDD memories, the quality of the food has stayed the same. I was a big fan of the crisp pork belly and appreciated the pull pork pancake (even though it was not my cup of tea) before Guy visited. I’m happy to say that not only has the food stayed tasty, but the friendly owner still checks in with the customers and the service hasn’t changed either.